Like a fairy tale, once upon a time doing business in this country was a much different endeavor. Most of the time, your business consisted of a occupying store front, possibly advertising in the local paper, or sending out circulars or coupons and hopefully new clients would find you. If you wanted to expand your business, you simply looked for another location and started the process over. In a relatively short span, business is done a whole new way. Now more and more companies are opting for a web only presence, which means they can do business anywhere in the world and expanding means adding more goods or services and not more physical locations. In today’s business where media plays such an integral part of business, chances are your standard business general liability insurance may cover the basics like such items as missing equipment or your warehouse destroyed, it is highly doubtful it would cover the theft or a loss of valuable company information stored on one of your servers hard drives, your company’s website shutdown from a power outrage, your computer systems and website the victim of a professional hacker or if your company is on one of many social media outlets such as Facebook, LinkedIn, Twitter or a company blog which could cause a false accusation claim. For a long time insurance carriers have wrestled with what their response should be for businesses that face different security and privacy issues in today’s tech environment. 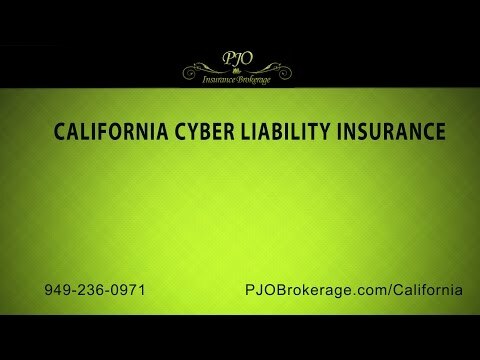 From the time Cyber liability was first introduced in the late 1990’s it has shifted from a simple tech and Orange County errors and omissions policy to more of a liability policy specifically tailed to companies of different sizes and descriptions. With the insurance carriers trying to anticipate the new exposures that come with the lightening fast changes that are happening in the technology field today, they have had to adapt faster to their insured’s new needs for more appropriate coverages that fit their clients needs. One thing for sure, Cyber Liability Insurance is not your typical standard insurance product. Most times the Cyber liability policy will be tailored to meet the client’s criteria or unique business needs, but it will also protect the business against two types of risk, first-party and third-party risks. In looking over the first-party standpoint, the policy may cover items like crisis management, hiring a public relations firm to manage a data breach incident, the costs associated with a forensic analysis, if your company were infected with a computer virus that destroys your company’s software and data, the cost of hiring a tech company to repair and restore your company’s computer systems, and the loss of business income resulting from a data breach. Third party coverage refers to Privacy Coverage and Network Security; this may cover losses resulting from breaches in network security or unauthorized access events. Another area is Privacy Regulatory Proceeding Coverage. This generally is provided as a sub-limited part of the privacy liability coverage; which may cover costs resulting from a civil, administrative or regulatory proceeding that alleges the violation of a privacy law. The last area is Media Liability Coverage. Normally this extends to the more traditional and social media information provided by the insured to be disseminated online or offline. In talking with companies on this subject and especially considering that number of companies that report being hacked these days, many businesses seem extremely confident in their companies’ firewalls and virus protections they’ve already installed and seem to have the opinion cyber liability coverage, also known as Internet liability or network and information security liability coverage, as a luxury and not a necessary coverage. In discussing this with several of the industry experts, there is a strong disagreement with that way of thinking and most feel the company is a bit overconfident. For any company, one of their biggest fears should be is unauthorized access from a virus, thus allowing a third-party to breach the system. Since cyber liability insurance is not a conventional insurance product, the pricing of policies can be very diverse, making comparisons among the various cyber liability products difficult and sometimes confusing. Post by PJO Insurance Brokerage. It should be noted that premiums for Cyber Liability Insurance coverage is based on the gross sales of the company, therefore higher sales will equal a larger insurance premium. Unlike most claims that have a definable timeline that may disrupt your business operations, Cyber Liability Insurance is not like that, it’s a claim that could evolve over a much longer period of time. Our agency suggests you take some time and analyze your current business structure, review just how valuable your current data is to your business and what would be the consequences if it was breached. If you feel that this type of loss could cause your company severe financial hardship, having Cyber Liability insurance may be the answer. If your company possess what we refer to as valuable data, especially if there are associated with regulated personal, financial or medical information about clients or consumers, you may be wise to consider adding “privacy” coverage for the potentially onerous costs of a data breach. If your company would struggle to survive an extended website or computer-network shutdown, you may need network-security coverage. And if your company hosts any online discussions and risk libel or false-claim accusations, media coverage may be the proper coverage for you. PJO Insurance Brokerage in California would welcome the opportunity to sit down with you to discuss how this coverage can benefit your company.